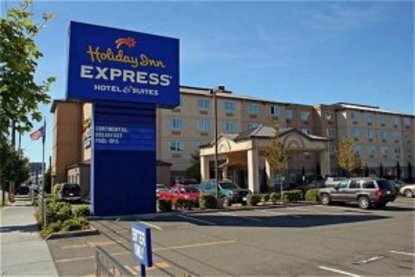 The Holiday Inn Express Hotel & Suites, North Seattle is your home away from home. We invite you to experience the friendliness of our staff and greatness of a fine Seattle hotel. We are also nearby Seattle downtown, University of Washington (UW), Safeco Field, Key Arena, Seattle Waterfront, Seattle Aquarium, Washington State Convention & Trade Center, Northgate Mall, Shoreline Community College, Shoreline Conference Center and Woodland Park Zoo. Located just seven miles north of downtown Seattle, on Aurora Avenue North (Highway 99) with easy access to I-5, our location offers all of the convenience of downtown without the downtown inconvenience. This hotel is committed to providing accessible facilities under the American Disabilities Act. If your accessibility needs are not met, please contact the Hotel Manager on Duty. Should you require additional information regarding accessible facilities for guests with disabilities, please call 1-800-Holiday (U.S. and Canada) or contact the hotel directly. For the hearing impaired, TDD service is available at 1-800-238-5544 within the U.S. and Canada.